Last night was the first high school swim meet for Alex and Taylor. This year high school season will be a little different than that last two. For one this is Taylor’s 1st high school season swimming as a freshman for Loveland High School, so both girls will be swimming for the high scool team this year. Plus we have a new coach, Dan Ketchum. Coach Dan was an Olympic gold medalist in 2004, so he will bring a different mentality and energy to the team. 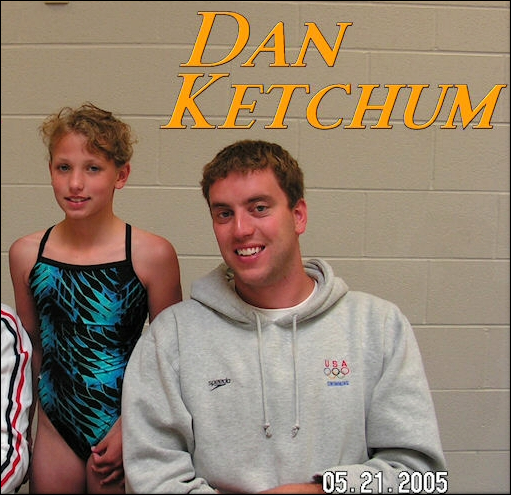 An interesting fact is that the girls met him at a Olympic swim clinic held by the Cincinnati Marlins in 2005. Now, they are swimming for a team he is coaching. Pretty cool. This meet was a dual meet against Kings and Glen Este both schools in the same conference with Loveland. Alex and Taylor began the night swimming together in the 200 Medley “A” Relay. Alex was the lead off leg swimming backstroke and Taylor swam the Butterfly leg. Alex built a nice lead on the backstroke that they never gave up. Taylor entered the water with a sizable lead and kept it that way. They won the relay handily. For individual events Alex was swimming the 200 Free (not her favorite event) and100 Back (one of her best high school events). Taylor was swimming the 200IM and 500 Free. Neither of these events rank high with Taylor. She said before the meet started, “He hates me.” referring to Coach Dan. Alex was up first in the 200 Free. She went out fairly slow with the 1st 100 being a little over a minute, but she had the lead. She actually slowed down. At one point I figured she was swimming just fast enough to win. At the end the one girl challenging her was right there and I was not really sure who had one the race. Alex did manage to win swimming it in a 2:09, which is 6 seconds slower than her PB. When I asked her afterward what happened she said she had no energy. She had gone to a friends meet prior to her meet and had not eaten anything since leaving home around noon. The meet started at 7pm. Taylor’s first individual event was the 200IM. You start with the Fly, so she always gets off to a fast start. After the back she had a huge lead which she did not give up. She won with about as 2:20 time and beat the 2nd place swimmer by 18 seconds. Not bad for her 1st high school swim. Taylor had to swim the 500 Free next, which she was not thrilled about. Right from the start if looked like she was going to have to race if she wanted to win. She was dead even with another girl through the first 10 laps. At the half way point the other girl started to pull away little by little. I was wondering if she would make a run for the win, but she did not. She placed 2nd with a 5:23 time finishing about 3 seconds behind. That was a little faster than she swam her 500 Free at the meet the previous week. Alex swam the 100 back next. She was swimming against the same girl who had beat Taylor. Normally, I would expect Alex to win, but after her slow 200 Free I wasn’t sure what to expect. I had given her a power bar after the 200 Free, so I was hoping she would get some benefit from that. Well, she led from start to finish swimming about a 1:06. While that is a little off her times from last weekend, it was good enough to win again. Finally, the last event of the meet- the 400 Free Relay (4×100). Once again Alex and Taylor were teamed up on the “A” relay. When I was talking to Alex before this event she wasn’t so sure if they would win it as a number of our best swimmers were not at this meet. Alex swam the lead off leg and built a nice lead with a 57.56 (only a little slower than her 100 swims from last weekend). The 2nd leg held on to the lead, but the 3rd leg gave it up and then some. Taylor went into the water a couple of body lengths behind. The girl she was trying to catch was the same girl that had beat her in the 500 Free. She went in definitely going for it a she was closing from the start with a powerful white water kick and arms working feverishly. After the 1st 50 she had nearly closed the gap. At the end she finished a good body length ahead swimming a 56.75 split for the win. Coach Dan was nervous when Taylor went in to the water so far behind. I must admit I had my doubts knowing she was swimming against the same swimmer who had beat her earlier. Mr. Hoffman, one of Taylor’s old middle school teachers, was going nuts as Taylor over took and passed the other swimmer. At the end Coach Dan gave a little fist pump in victory. Mr. Hoffman’s comment was, “They say that girl can swim. They weren’t lying.” It was a pretty cool way to finish their 1st meet of the season. Alex 4 1st place finishes. Taylor 3 1st place and 1 2nd place finished.